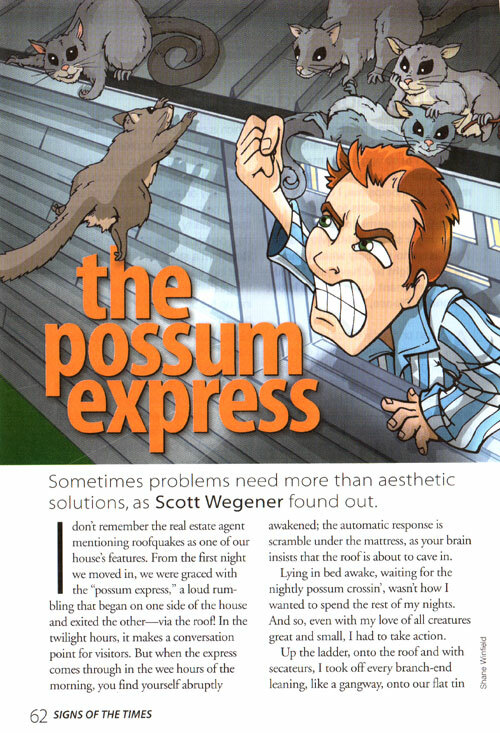 Lying in bed awake, waiting for the nightly possum crossin’, wasn’t how I wanted to spend the rest of my nights. And so, even with my love of all creatures great and small, I had to take action. Up the ladder, onto the roof and with secateurs, I took off every branch-end leaning, like a gangway, onto our flat tin roof. Then, once satisfied with my trimmings, I headed inside and later to bed with a feeling of relief. Poor possums, I mused, they’ll have to take the long way around tonight. I hadn’t even made it out of my slippers when Thud! Rumble, rumble, rumble, rumble. . . . Grumble (that was from me). The possums now jumped onto the roof, making even more noise. Realising that my attempts hadn’t impeded the possums at all, it was obvious that more drastic action had to be taken. It was back to the roof the next afternoon where a little more vigorous pruning took place. Not wanting to ruin the appearance of the tree, I cut it back as far as aesthetically allowable. Satisfied, I headed inside and planned to enjoy the rest of the evening filled with serenity. Whump! Rumble, rumble, rumble, rumble. Sob. (That was me). Possies, 3; Scotties, 0. The next afternoon I left the secateurs in the shed and went for a saw. This time I trimmed back as far as I could safely reach, ignoring aesthetics altogether. 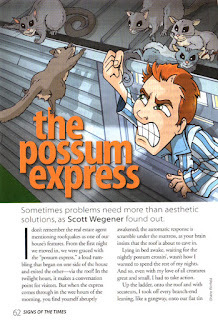 After declaring out loud to the surrounding trees, where I knew the possums were watching, “No possum shall enter thy roof evermore,” I retreated inside. That evening I fell asleep in quietness, the first for a long time. I was sleeping well until BA-ANG! (Pause) Rumble, rumble, rumble. Growl! (In case you are wondering, the growl was also from me). Right! I fumed. This is it! Satisfied that any possum foolish enough to attempt the distance would end up sliding, claws extended, down the side of the house, I stood back and gazed in awe at the “canyon of death” between tree trunk and gutter. What possum in their right mind would dare take on this challenge? Then, content that my hard work was sufficient for a peaceful night’s sleep, I ventured inside and settled down for the evening. With glee I listened to the frustrated rustling in what was left of the tree. I fell asleep. At last. . . . That night was the first I couldn’t remember—or didn’t experience—a roofquake. And there’s a moral: Sometimes there is cause for a change in your life. Whether it be the attempt to free yourself from some bad habit or addiction, or even being the first to take a stand for a belief that differs from your family or friends, things can seem to get a lot worse than if you’d stuck to the old ways. Just stay focused on attaining the higher goal you’re heading toward and, eventually, you’ll make it. We’ve still got possums around home, especially when we fire up our barbecue, but having worked through the initial storm, we live in happy coexistence.